So you own an apartment complex. You have many tenants, lots of different leases, and even more responsibilities. You have to ensure the complex fits the needs of those around you on a daily basis. Everything has to look fantastic every minute of the day, one slip up and the next thing you know a tenant is moving out. Your apartment complex’s landscaping must be in great condition, as a nice outdoor communal space will draw tenants in and keep them happy while they are with you. 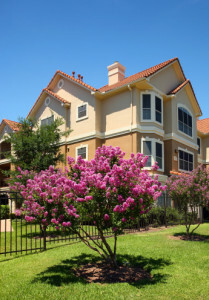 So how can you maintain your apartment complex’s greenspace? Just follow these steps, and you will be an expert in no time! If you want to make your apartment landscaping to be visually appealing, you need to diversify your agriculture. Everyone likes a nice patch of green grass, but you should have more. Bark mulch is a great way to do this, as the mulch creates a beautiful contrast with grass while also collecting water and preventing weeds. Weeds kill other plants and make your greenspace ugly. You do not want to kill other pants and have your greenspace look ugly. This should be a pretty simple conclusion. There are many tricks to weeding, including covering them with a ground cover, just pulling them out, spraying them with approved anti weed spray, and pouring boiling water on them. Again, diversifying your green spaces is key to an attractive apartment complex. Adding trees and shrubs will make your complex appear vast and interesting, rather than plain and boring. Make sure to get different types of shrubs and trees, as the bigger your collection the prettier your greenspace. In order to keep your greenspace intact, you will need a worthwhile irrigation system. We wrote about irrigation systems at length here, so make sure you find the right one for your apartment complex’s greenspace. Once you install your irrigation system, don’t forget to maintain it! Changing your greenspace’s scenery for the seasons not only improves the area as a whole, but it also prevents tenants from getting bored of your complex’s scenery. These displays can also attract the eye of potential new tenants. No greenspace is complete without grass! Make sure you continually maintain your grass, which includes mowing, sodding, and much more. Your grass is essential to the rest of the space, so make sure you treat it well. Those are the key steps to creating a greenspace your apartment complex will be proud of. If you are interested in more gardening tips, check out our blog. If you want help with all of these duties, contact the experts at Greener Horizon. We are well versed in creating and maintaining apartment complex greenspaces, so you have one less thing to worry about while being the landlord.